milk dreams: IKEA...man, those Swedes are clever! IKEA...man, those Swedes are clever! Maybe it's because I grew up in Singapore and our weekly Sunday family ritual included church, dim sum, and then a trip to Ikea to play in the "many balls." Or maybe it's because I'm a major nerd and I am tickled by simplistic innovation (read: I actually enjoy building IKEA furniture). But one thing is for sure: from sitting in their cafeteria and eating 99 cent cinnamon rolls and downing free refills of carbonated lingonberry juice to waiting in line with a giant flatbed cart full of twice as many things as you meant to buy, I get a wind of excitement from a day at IKEA! Love it or hate it (I know I just raved about how much I love it, but I also spent one of the most miserable afternoons ever at the IKEA in the Netherlands on the outskirts of Amsterdam a few days before Christmas that was so chaotic and hellish that my dad looked at me afterward and solemnly said: "never again." The only thing tha redeemed our day were the warm and delicious aebleskivers being sold out of a truck in the parking lot--brilliance! ), IKEA is a necessary staple for many of us city folk on limited budgets! If you live in a major metropolitan area in the U.S., the chances are pretty good that you have fairly easy access to an IKEA. Last winter, Jude and I were deciding what to do about baby furniture in our then-one-bedroom apartment. We knew we needed a crib and a changing table and at least one new chest of drawers to accommodate all the new "stuff," and that we wanted it all to be affordable and compact. I found the giant cribs with the even bigger pricetags at places like Pottery Barn and the like to be downright laughable. I mean, really...how long is this kid going to sleep in there? I couldn't justify the space or the cost for a designer crib or a fancy tabletop to wipe my baby's bottom. The answer was simple: IKEA, IKEA, IKEA. We don't have a car, so we rented one for a day and zipped around Brooklyn running errands, having food at normally-inconvenient locales, and, of course, a few hours at IKEA to deck out our digs for the newcomer. I alluded to it earlier, but I will scream it from the mountaintops: IKEA furniture is amazingly simple and I find the pictures-only directions to be just so darn clever! I have built a ton of IKEA furniture over the years to furnish apartments in Chicago, LA, and Brooklyn, and I have yet to find any directions that didn't work out perfectly if followed exactly. Jude loathes building furniture, so he cooks me fabulous meals while I lay out all the pieces on the floor and get to work. I built a crib, a changing table, and two dressers in three days at six months pregnant--phew! I had just read an article about how babies hear things from in the womb and sounds they hear a lot become second-nature to them by the time they are born, so we always laughed about how Ruby will always feel at ease in her lifetime to the sound of hammering. Here is our changing table all set up before Ruby was born. 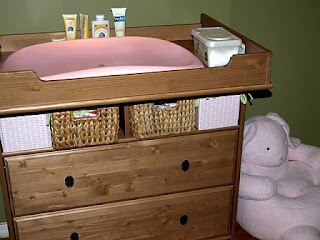 The cool thing about this is that the overhanging part that makes it a changing table is actually only a $20 separate add-on, so, when we no longer have need for a changing table we will remove it and have a regular dresser. This is the Leksvik cabinet ($149 as a dresser, $169 with the attachment to make it a changing table). Here is Ruby's simple little Leksvik crib. It may be small and simple, but it is also surprisingly versitile. It starts with the mattress high when you first build it. I recently had to lower the mattress which I was able to do by myself one afternoon (though it was a little bit of a pain to not have a second set of hands when I had to turn the crib over and balance the boards while screwing in the bolts). When Ruby gets bigger, we actually have two other boards stashed away in a closet that will allow me to turn this into a toddler bed! All for $159! We also now have a few other dressers and pieces from the Leksvik line for Ruby's things. I haven't really bought much else for Ruby there--they have adorable feeding and bathing accessories and fun toys, but I didn't buy any of them while I was there because I hadn't done any research into what kinds of materials they use for things that would potentially go in baby's mouth or be used with soaking. If anyone happens to know whether their cute froggy dinnerware is BPA-free, let me know! They have a simple folding highchair, too, that is a great space saver. One thing I find drool-worthy that Ruby is still way too young for is their adorable play kitchen and all of the accessories. So so cute! Anyway, if you're looking for simple and affordable baby things that are also appropriately small for your small baby in your small urban home, don't forget IKEA! you sound just like me! my husband loathes Ikea, but i love it! i also enjoying building our purchases. we have a medicine cabinet, bistro table, 4 stools, 3 bookshelves, our bed, & for our baby a wardrobe. i was just looking into getting a bed for our little one (5 months), as well as toys (i would also like to know if they are bpa free). the play kitchen looks really cute, too! 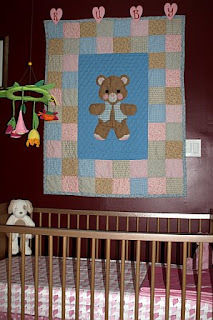 The November 2009 milk dreams post entitled "raising a little citizen of the world" won 2nd place in a contest on Tea Collection's wonderful blog. Click the picture above to check them out! A.K.A. Annie. Wife to Jude. Mama to Ruby. Lover of life. Montauk, NY: Our first family vacay! Ruby is the sunshine of my life! Jude is a phenomenal husband and an even better dad! Public nursing on Sesame Street! Ruby loves hats and hoods!